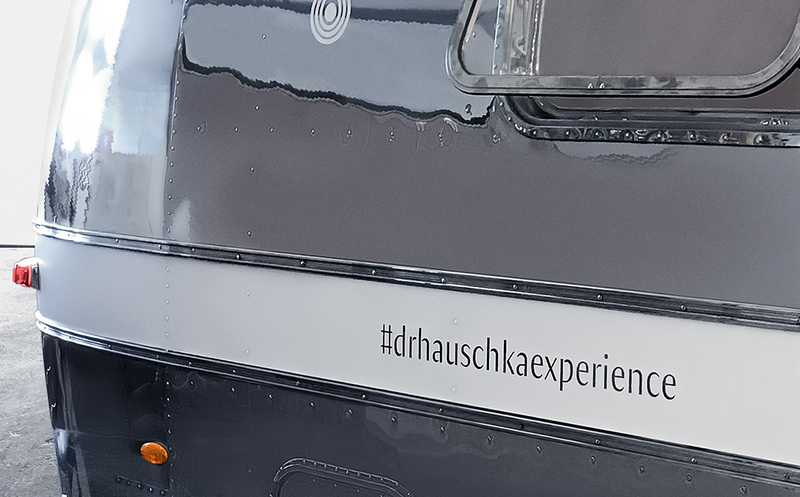 Dr. Hauschka Cosmetic presents: an individually developed, recycled Airstream from the 70s, which functions as a mobile world of experience and creates the perfect space for encounters. For one summer, the vintage trailer will travel throughout Europe with make-up artists and estheticians, showcasing the world of Dr. Hauschka. Like Dr. Hauschka, the iconic, timeless design of the Airstream has a long tradition. That’s why during the restoration even small scratches were deliberately left on the aluminium to preserve the history and character of the trailer. The world of Dr. Hauschka Natural Cosmetics can be experienced with natural elements in the newly designed vehicle interior. The trailer invites you to discover and try out the effective cosmetics and nourishing make-up: product tests, hand massages, fresh-ups, individual consultations and make-up touch-ups are all available. Dr. Hauschka Airstream is a feel-good place that also invites you to linger with outdoor seating.